Cozy cottages with breath taking mountain views! Close to the Ice Castles in Lincoln in January and February. Enjoy breathtaking mountain views in a cozy cottage. Whether in the winter, summer or fall, there are various activities to enjoy. In the winter we are minutes away from top skiing resorts in New Hampshire. In the summer enjoying swimming and tubing down the river 3 minutes away. We also have a seasonal (late may to mid September) heated pool on the property and a year round hot tub. Play a game of basketball. All our cottages are newly renovated. The mattresses, linens are all brand new. We strive to maintain the cleanest, coziest cottages in the area. It is a self check-in. Please wash all used dishes. Place all items back to their original locations. Quite hours observed 10 PM to 8 AM. Guest are expected to leave cabins reasonably clean. Cleaning fee includes washing towels and bedding, cleaning and disinfecting of your cabin. Housekeeping is available for an additional $20.00 per day. Male mid fifties enjoys working with people, hospitality manager and retail manager for 30 years, renovation of homes, degree in management from U Mass Boston. The view of the multiple mountain ranges, easy acess to major routes and restaurants shopping, opportunity to have guests enjoy the 8 different styles of cabins on the property. We have a clear blue HEATED pool, overlooking the mountains. Enjoy a game of basketball on the basketball court. Tube down the river, go for a dip. Canoe down the crystal clean river. Truly outstanding experience. Perfect location with quick access to multiple ski resorts. 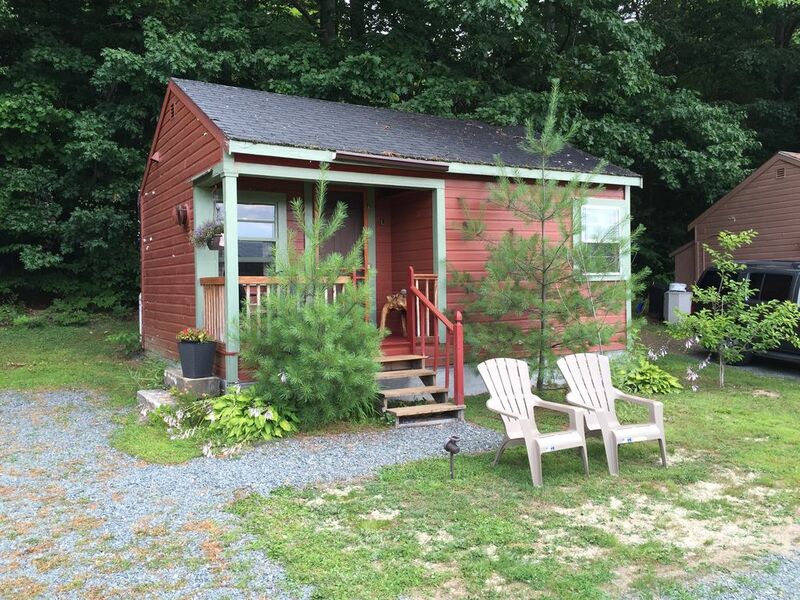 Perfect for two people who want a quiet get away in thw white mountains. Cabin is in great shape with all the ammeneties and upgrades you can ask for. We will definitely be coming back. Highly recommend. The cabin was perfect for our little weekend, we wanted a cozy and 'disconnected' place to rest, and that is exactly what this place was! Awesome cabin in a beautiful setting. Had everything we needed and was a cozy home to come to in the evenings after adventures around the area. Close to many beautiful places. We enjoyed our relaxing soak in the hot in as well amongst the beauty of nature! enjoyed our stay at cabin. great location. numerous grills and picnic tables are a nice touch. especially liked the electric fire place in the cabin- it even throws off heat! Peaceful and quiet!! Enjoyed the view of mountains in the morning while drinking a cup of coffee. The cabin is ideally located to hiking, shopping and sightseeing. Perfect weather. Absolutely loved our stay here! $89/ nt Last minute specials are available, give us a call. Rates Depend on season Holidays and vacations weeks considered premium rates. Weekly discount package available.